Savvy Spending: FREE Pass to All Federal Parks, Lands, and Water for a full year for ALL 4th Graders!! 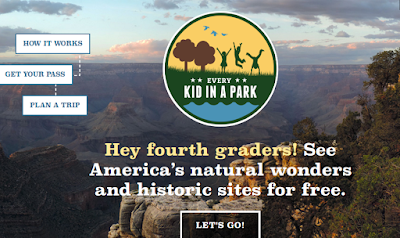 FREE Pass to All Federal Parks, Lands, and Water for a full year for ALL 4th Graders!! Do you have a 4th Grader in your home? Check out this awesome freebie! All Fourth Graders (including home-schooled and free-choice learners 10 years of age) and their families can receive FREE access to ALL Federal parks, lands and waters for a full year! Even is the site you're visiting charges a fee per person, this pass admits all children under 16 and up to three adults for free, plus it covers one passenger vehicle for free! To get this freebie, just go here, complete an online activity, and then download and print the personalized voucher! The paper voucher can also be exchanged for a more durable Annual 4th Grade Pass at certain federal lands or waters sites. Go HERE to find parks near you. 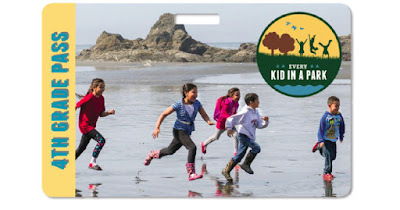 And be sure to like the Every Kid in a Park Facebook page for tips and updates! These passes are valid beginning September 1st and ending August 31st of your fourth grade year. The pass is for the 2016 to 2017 school year. It expires August 31, 2017. If your group visits a site that charges vehicle entrance fees - The pass admits all children under 16 and all adults in up to one passenger vehicle. Commercial vehicles can't use a pass to get in. The pass doesn't cover things like parking fees, camping, boats, and special tours. Also, some sites are managed by private operators. They may not honor the pass. Check with the site ahead of time to find out.